Bored will full access to a gym. Perfect combination mate to make some big changes! yea the first 3 months i was here I really fell into a rut of not training, smoking 20 a day and working nights too so sleep was a mess. I've always been an on-and-off smoker and when I'm away from home all the bad habits take over. So far not smoked since september 7. down 3.5kg in 2 weeks. And probably one of the best changes is I eat greens in every meal, something I have basically never done, so I'm hoping for all-round health improvements. Didn't feel so great, cutting and deadlifting heavy never really mixed that well. first time I ran solidly for over 1km without having to reduce speed. Definitely seeing some progress on this which is satisfying. with 14kg dumbells each hand. 3 sets to failure. Got to about 12 steps each time. glute emphasis hypers, 3 sets w/15kg to fail. experimented with Tabata on treadmill, it has interval setting. Did a few rounds but wasn't really sprinting. Will go flat out next time. weight was hovering around the 100 mark for a while, mostly below but sometimes above. Today was 99.0 which is solidly below so I'm satisfied with that. eccentric cable flies. trying something where you press the weight out, then fly on the eccentric. The idea is you choose a weight too heavy to do a normal fly, so you are overloading the eccentric. Makes it more interesting since chest day is so boring. chest press machine for fluff. For me its way less boring than steady state cardio. leg extension - doing these two legs concentric 1 leg eccentric, trying to burn out quads. cable pulldown, bike for a few minutes. Weight loss seems to be going well mate. Yesterday I tried to do 10x10 on BOR with 60kg, but I havent really done bent over rows in ages and dropped the weight after the 4th set to 50kg. I never used to give shoulders a whole day but they are probably my worst bodypart so why not. My weight is down to about 95kg, which is 10kg down from about 7 weeks. this week I started doing some 10x10 sets because I didn't want to cut any more calories. I'm switching up between steady state cardio and HIIT, doing 3 cardio sessions per week. In terms of fitness and diet I've probably never had better habits than right now. trying to eat a bit more carbs because it makes life a bit less miserable. Making up for it with the volume training. Trying to hit abs 3 times per week too, mostly hanging leg raises, but way more strict than I used to do them, and ab wheel. I did 10x10 squats of 60kg. I got a pretty good burn but it wasn't like the last time I tried to do it with 100kg with belt and long rests and almost died. This time was fast, 1 min between sets + time of actual set, so 15 mins roughly, then 5 x 10 on leg extension, 5 x 10 hamstring curl then leg raises superset with reverse lunges, just to keep the heartrate up. GF% progress seems to be going ok, it's slowed down a bit but I think its still going down. I still have the lower pec/armpit fat which might be my cut off point for this cut, once that's gone I might just maintain..
Are you still on base then? went home for most of december and start of jan, drank a lot of beer, at a lot of **** didn't put on much weight tho, must have been some bad recomp going on. But I'm back, diet and training is pretty disciplined. Legs looking ok too but cant get a good shot of legs from selfie. 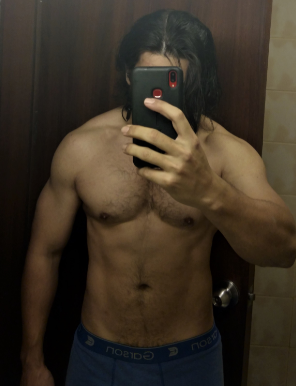 Will use this as reference as I'm trying to lean down to maybe 10% bf if possible. Currently I'm on 2 meals a day, no real restrictions just portion control. I came up with a routine of push pull push pull. But legs are included in that. So push day will be squat+ bench or OH and pull will be deadlift variation and chin or row variation. And I jut go push pull push pull as many days per week as I have energy for. Strength level is pretty low especially for squat. The rack I am using is like a wobbly multipurpose thing and theres no safeties. The days of me hitting 3plates+ are over until i get a new job. leg extension 3 sets to fail. weights getting a bit heavier so im switching to a more traditional split, but I'm doing 5+ days a week usually. instead of HIIT i did a hill walk, for 12 mins pretty brisk. GOt the legs feeling like jelly. Ab wheel 3 sets of 20 - getting much better at these now. last week before going home. Went for deadlifts. I haven't been doing powerlifting training in ages, so I just went heavy to see where I'm at. bodyweight is 88kg, so more than 2x bodyweight is pretty decent beltless. I think it's a beltless PR, i almost never used to deadlift above 140kg beltless but actually with my back feeling good these days I can do it easily. Bench and squat will be way down because of available equipment. I'm fairly lean right now, but still not what I'd call ripped.